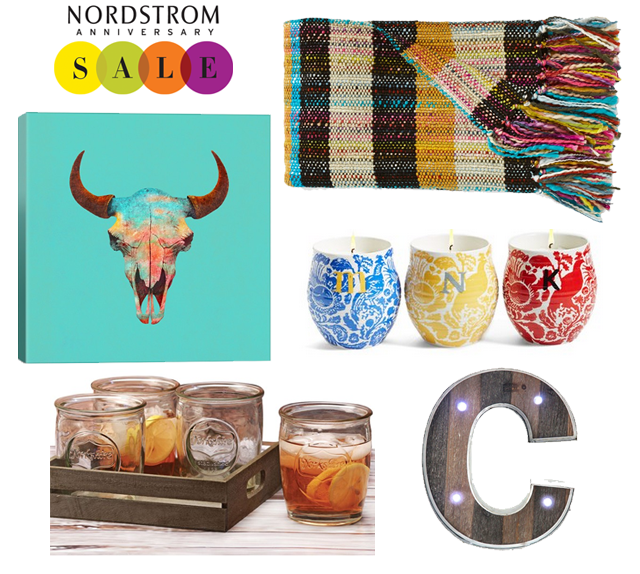 Assuming you haven't been living under a rock, you have probably seen/heard about Nordstrom's Anniversary Sale. Y'all know I am trying really hard not to spend extra money....so I have seriously added and removed things from my cart so many times that I'm convinced Nordstrom is just going to have pitty on me and send it all to me free of charge. While I wait on that to happen, I thought I would share some of the things that I am SERIOUSLY considering buying. I mean, truth be told...there are lots of great deals to be found, but I'm not going to be buying any over the knee boots or designer purses anytime soon. I'll start with some of the home decor type stuff today. I just want it all, K? First, those adorable glasses (and the tray!) are less than $10. And the candles remind me of my coffee mug I got from Anthropolgie! That throw and the cow print would look fabulous is my living room. I have a faux fur throw that Daphne (the cat) confiscated. She doesn't share, but that's fine since it's pretty much a catch all for her fur (thus making it a semi real fur throw...ew. haha). Anyway....this one is 1) adorable 2) matches my living room and 3) less than $40. Though I do love a good monogram...I try not to have them ALL OVER our apartment, ya know? But, this one is super fun. What do y'all have on your list? I was so focused on the clothing and shoes that I should not have been purchasing that I didn't even realize the home goods that were on sale! I love your wishlist, especially those glasses, adorable! OMG. Love those glasses and that blanket. I must be living under a rock! Hadn't heard about this sale!